Hello guys, I'm having a problem when I try to access the IDCUser's detail. Only if the logged user has administrator permission that the error does not happen. I have attached a print showing my configuration of Data Access Permissions of Users' role. Unfortunately we can't reproduce the issue. or send us simple sample? I'm not using the Xafari Authentication. This may be causing the problem? I have attached a sample project to more clarify the situation. I forgot to attach the database backup wih my configuration. Please login with 'usuario' without password. Give us some time to research this issue. 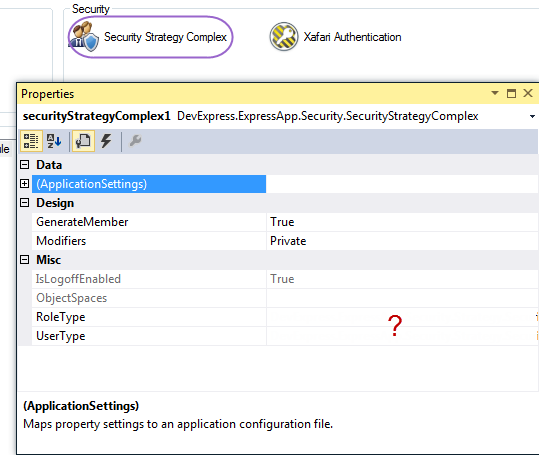 Xafari Security using extension for your Xafari version and new versions. Sorry, we did not change the Security documentation. We attach a video for you to address the issue with 'IDCUser's DetailView'(attached file Security.zip). Hello Sasha, this solution solve the problem but I have a much wider application with several users and wouldn't be feasible to apply this solution. I would like to understand why the MyDetails View problem occur only if the logged user doesn't have the Administrator Role. - examine the script (attached file SQL_Script.zip) and run this script for your DB. This script adapts the database for its proper operation. However, I implemented a temporary solution redirecting the "My Details" to another view because it has many IDCUser's calls in code as well. I will schedule this change as soon as possible.